By Political Concern: UK aviation policy is primarily predicated on the requirements of airport operators, major airlines and the Treasury – the needs of passengers come last says Steve Beauchampé in The Birmingham Press. That it does so is the result of a system that essentially forces millions of UK passengers per annum to travel long distances, often in arduous and stressful conditions, to use both Heathrow and London’s two other main airports (Gatwick and Stansted) at great cost both to themselves and the environment. rather than utilising their local airports, many of which are working to a fraction of their capability. Birmingham International Airport handled 12.9m passengers in 2017 but could cope with around double that number. Meanwhile, Nottingham East Midlands welcomed a paltry 4.88m whilst major population centres such as in the North East, South West, South Wales and along the south coast are all but bereft of decent flight choices. This is not only down to the London-centric approach which blights so many activities in the UK, but the failure of successive governments to challenge and take on the vested interests of London airports and the major airlines. The first is that Heathrow must continue developing as a ‘hub’ airport, competing for passengers not with Birmingham, Manchester or even Gatwick, Stansted and Luton, but with Amsterdam, Frankfurt and Dublin and increasingly Dubai! 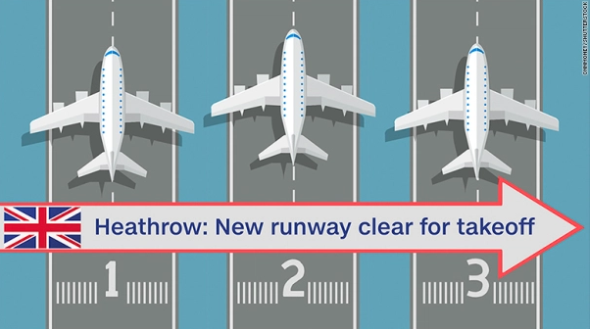 So a third (and later probably fourth and fifth) runway at Heathrow is essentially required to allow the airport’s operator Heathrow Airport Holdings to attract passengers who will never leave the airport environs but whose visit is solely to transfer from one aeroplane to another, Great news for HAH, who enjoy increased landing fees as a result, and good news for the Treasury, who collect airport tax each time that a passenger takes a flight. But it is hardly good news for UK travellers who are not being provided with flights from their local airports to the locations that they want and at a time when they want to fly. Indeed the hub strategy encourages those in the north of England, Northern Island and Scotland to take domestic flights to Heathrow and then transfer planes to reach their ultimate destination. Yet hub airports may soon be an outdated concept, with technological improvements meaning that modern aeroplanes will be able to fly further (and faster) without the need to refuel (it’s already possible to fly non-stop from London to Sydney). Point-to-point flying seems more likely to be the way ahead. The second argument in favour of Heathrow runway expansion is that many airlines do not want to fly out of the UK’s ‘regional’ airports (with the possible exception of Manchester, which handled 27.7m passengers in 2017) and would be unwilling to give up valuable landing slots at Heathrow. But this argument is unacceptable. We would not tolerate train operators refusing to serve smaller stations nor bus companies running services only on main routes. To combat this attitude the number of slots available at Heathrow needs to be limited rather than endlessly expanded, whilst the national airport strategy that Conservative MP and anti-Heathrow Runway 3 campaigner Justine Greening called for earlier this week should focus on ways to create an environment which encourages airlines to relocate services outside of London and the South East. This is particularly apposite given that both Birmingham and Manchester airports will be stops on the HS2 network by 2030. And whilst there is a real risk that limiting slots at Heathrow will result in some airlines pulling routes and services out of the UK altogether, the country is a large enough aviation market to offer sufficient paths to profit that most such withdrawals will likely be less than crucial and, in some cases, perhaps temporary. In agreeing to support Heathrow’s third runway the government have committed to paying £2.6bn in compensation to those communities near to the airport that will be destroyed or significantly affected by the project. To which can be added an estimated £10bn in public funding for the new infrastructure and environmental measures required to support the expansion. How much better to invest this money throughout the UK to create a national airport infrastructure to meet the needs of the travelling public, and one befitting the world’s fifth largest economy. Did a 1912 Newspaper Article That Went Viral On Social Media Predict Global Warming?